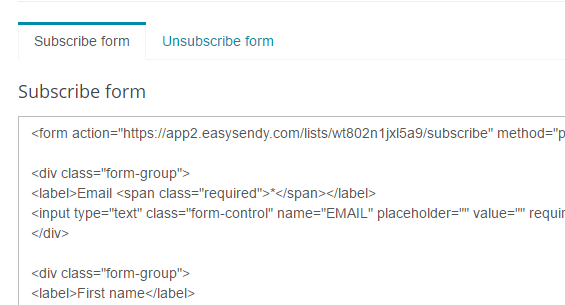 You can use EasySendy Drip (or EasySendy Pro) Email List Forms to directly subscribe or unsubscribe your mail subscription from a website, for your end customers. For this feature to work, Email List Forms code can be found under each email list. You need to go to particular email list from all email list dashboard and then, from email list dashboard click on “Forms Tools”. There you can find embed and iframe codes for subscribe and unsubscribe forms of particular email list. You can use this email list form inside website form building tools, email capture plugins, add-ons or directly on a website to receive the email subscriptions inside the particular email list seamlessly. You will need to add custom CSS styles to make this form look go on according to the color scheme of your website.